Havertz has been included in the Germany squad for their Nations League clash with France in Munich on Thursday and friendly against Peru in Sinsheim on Sunday, and the chances are he will return to Bundesliga action on Matchday 3 as a fully fledged senior international. His first cap will come as no surprise, however, for those who have monitored the down-to-earth midfielder's progress. While still juggling football with his school studies, he became the youngest ever player to appear in a Leverkusen shirt when he debuted on Matchday 7 of the 2016/17 season against Werder Bremen. Aged just 17, the young midfielder was an immediate hit and fittingly he became an ever-present in the side, wowing fans with a string of mature performances that earned him the fans' Player of the Season award at the end of his debut campaign. The gangly yet composed 6'2" midfielder has not looked back, developing into a rounded raw talent; the cornerstone of this Leverkusen team and, aged only 19, his first cap for his country is justifiably looming. Comparisons with another Leverkusen legend to wear Die Mannschaft's colours – and also their captain's armband – are inevitable, and Havertz not only shares the flair and agility of a certain Michael Ballack; his numbers also add up. With an average of ten shots required per goal, his ratio is only marginally inferior to Ballack's 9.6 attempts for his 77 career strikes in the Bundesliga. 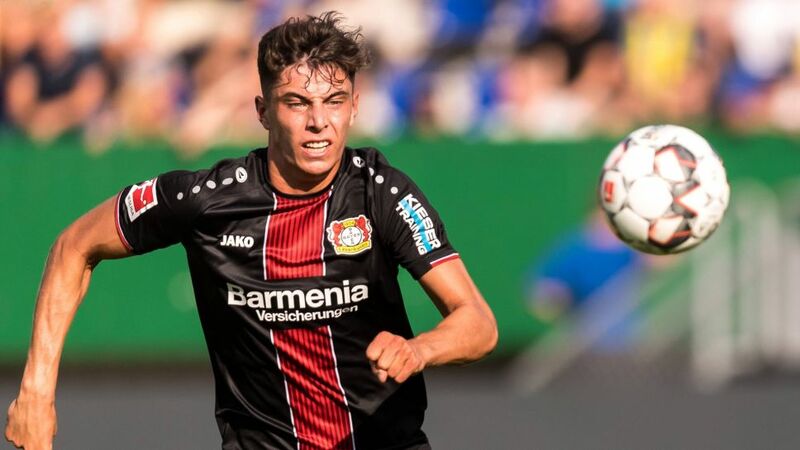 With 16 assists, however, Havertz is well on his way – in just 56 Bundesliga outings – to matching and bettering Ballack's total of 54 from 251 games. Furthermore, his uncanny ability to set up chances with either foot, both with equal aplomb, leaves defenders bewildered as they seek to usher him onto his weaker foot - he simply does not have one. Where Havertz also excels is in his pass accuracy, with only 18.4 per cent not finding their man, while Ballack misplaced 21.4 per cent of his. Meanwhile, Leverkusen's latest prodigy is already spending more time on the ball than 'the Little Kaiser': 62.6 phases of possession per game compared to 61.4. Last season, Havertz reached a top speed of 21.4mph, while he won 86 out of 188 aerial duels, making him the third-most dominant Leverkusen player in the air behind Jonathan Tah and Sven Bender. That said, his feet remain firmly planted. "I've always been brought up to keep my feet on the ground," he said. "I learned from my parents that arrogance and snootiness are not desirable qualities. Why should a footballer be any different to anybody else? We're normal guys, just like most people. Besides, I haven't achieved anything yet. Football is about winning titles, and I haven't done that since turning pro." Success nevertheless seems to be just around the corner for the 19-year-old talent, who carried on from where he left off last season with his first two outings in the Bundesliga in 2018/19. A 96 per cent pass completion and 68 per cent challenges won ratio even shows an improvement on his previous stats, with the added bonus of a Germany call-up. Joachim Löw will now understandably take a closer look at why Havertz is being tipped to follow in Ballack's footsteps and become one of his nation's most influential midfielders.